You can take your ear plugs out now, I have stopped ranting about the oil rigs. 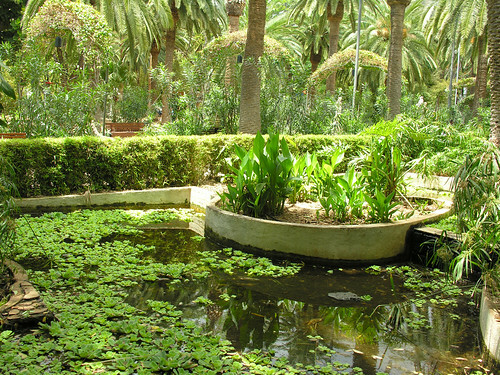 My day in La Laguna and Santa Cruz did have some unexpected uplifting highlights. The odd spot of drizzle and some gusty wind wasn’t enough to dampen my enthusiasm but it all perked up nicely when I popped into Parque Garcia Sanabria in Santa Cruz. 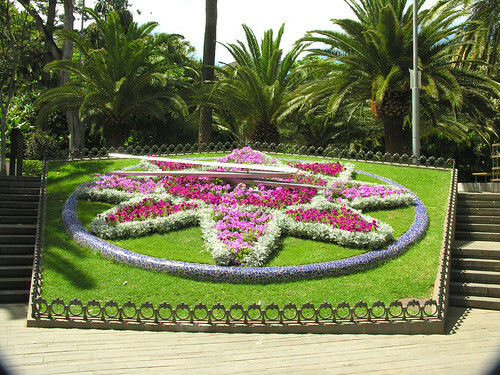 I knew the flower clock was back from Germany after a lengthy repair but there was a nice bonus, some of the palm trees just above the clock had informative panels built around them to explain more about the clock and its importance to Santa Cruz. 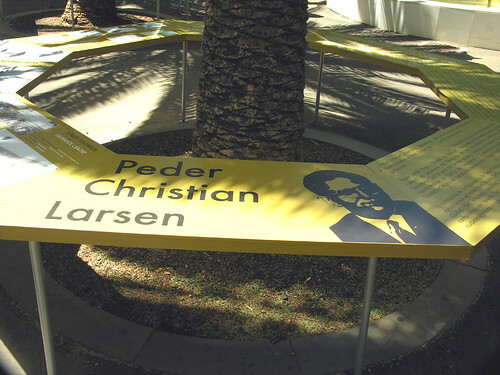 In Spanish and English they paid tribute to Peder Christian Larsen, this inspiring Dane arrived originally as secretary to the Danish Consul and later took on the dual role as Consul to Denmark and Finland. 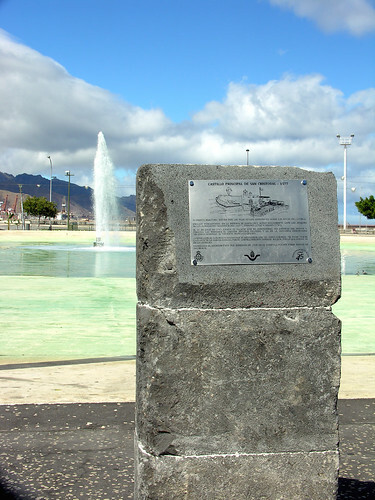 The donation of the flower clock, made by Swiss experts Favag, was just one contribution to Tenerife, he also helped to introduce a new Telex Siemens phone system to the island, co produced the first detailed tourist guide book, built the Santa Cruz outdoor swimming pool, and set up a Scandinavian shipping agency. His legacy also lives on in the south, he was instrumental in setting up Clinica Vintersol in the then fishing village of Los Cristianos, that was the building block for the tourism expansion of my home area. Another palm tree revealed the world interest in flower clocks, they are as widespread as Australia and India, there is even one in Edinburgh. What an amazing man, and let’s not forget Garcia Sanabria, a former Santa Cruz mayor who recognized and nurtured the community spirit of Peder. 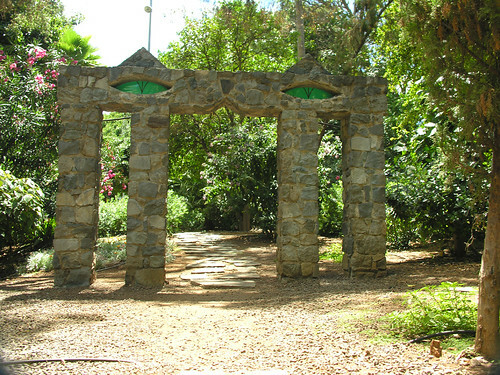 On a more modern level, I was pleased to see the results of the latest restoration work in the park, the sculpted archway in the garden area has been cleaned up to show its stylish face, yet another reason to visit this wonderful park. That seemed more than enough inspiration for one day but a brief visit to another favourite, TEA – Tenerife Espacio de Las Artes in Avenida San Sebastian brought another blessing. 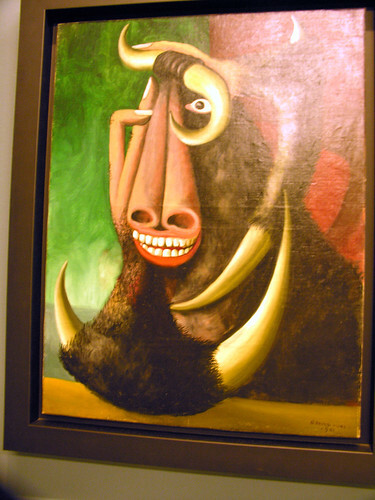 The lady on reception offered me a free entry ticket to the Oscar Dominguez exhibition “Between The Myth and the Dream”. I visited it around five years ago when it was an original display when TEA opened but I really like his surreal art so didn’t need asking twice. The great artist was born in La Laguna, his house there is now Café Oscar but when I first saw it the doorway was made like a sardine tin complete with a key at the top of the frame. 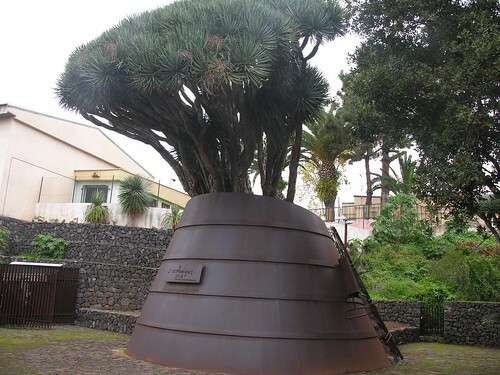 Tacoronte was another of Oscar’s homes and there is a nice little plaza there (above) with some artistic tributes to him and his former home is identified with great pride. TEA is a fantastic place to visit, just across from the “African Market” of La Recova, just the look of the building is enough to tweak your appreciation and it houses the huge library, a café, and a cinema. The work above is a self portrait of Oscar, well we have all felt like that in the morning, and one of many interesting pieces. 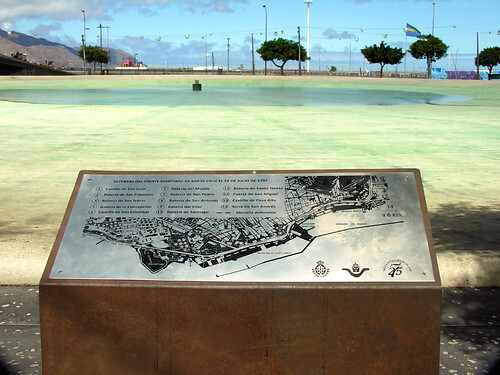 Tenerife is very good at preserving the memory of those who have contributed to its culture, I was pleased to have found out more about just a few of them. 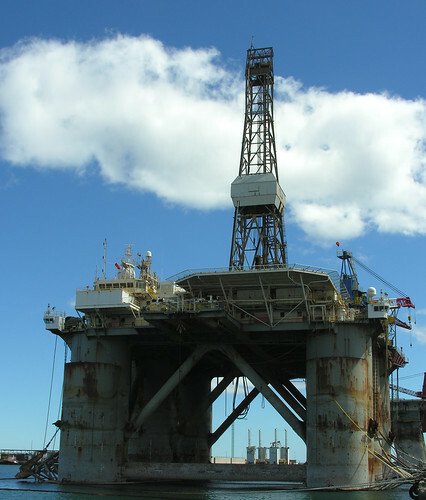 Shocked, downhearted, and generally cheesed off is not my normal reaction on arriving in Santa Cruz but walking out of the main bus station two monster oil rigs were staring across at me, and they looked horrendous. It was just two months since my last visit when two rigs were moored some way beyond the port wall but now it looked like a good turn of speed down Avenida Tres de Mayo would enable a short leap over onto the platform square on to the road that drops down past El Corte Ingles and the bus station. 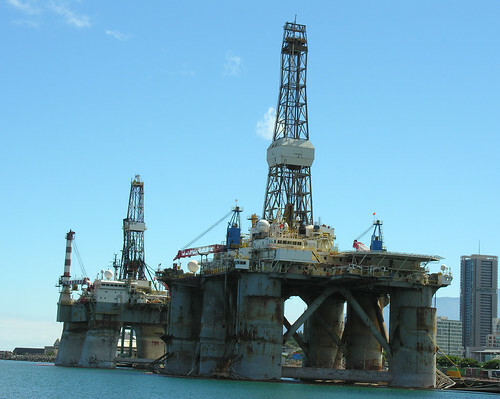 All this must sound alarm bells as oil companies gear up to make test drillings off Lanzarote now that the Spanish government has granted permission. One of my reasons for popping up to the capital was to check out preparations for the 25 July anniversary of Nelson’s defeat in 1797. Over the last couple of years 12 commemorative silver plates have been posted at key points of the battle in Santa Cruz and now five more have been added around Plaza de España and along the Via Litoral. This is where the road has been sent down a specially constructed subway tunnel to allow more pedestrian access to the city centre, the 48 million euro project started in 2009 and is nearing completion. This scheme has opened up loads more leisure space and will draw cruise liner tourists into the heart of the capital. I have been very impressed over the last decade as the tram system, three floor bus station, and the new Plaza de España lake have given the city a modern, sleek look. 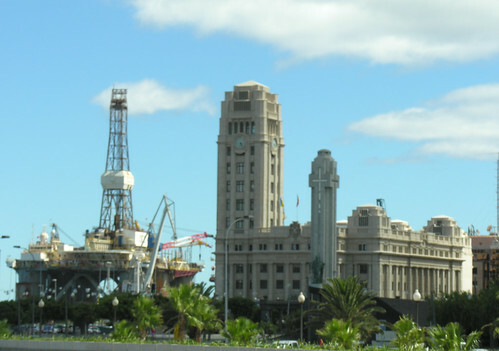 The views are not so impressive at the moment, the two rigs, another lurks outside the port wall, stand taller than the Cabildo headquarters, Torre de Iglesia La Concepcion, and several other historic landmarks. Coming back down from a detour to La Laguna it was a similar story as the new arrivals dominated the skyline. There’s a big protest movement to resist the drillings and Canary Island government calls for a referendum. The vote would have no legal power but it’s hoped a show of the strength of feeling may force a change of mind from Madrid, the Balaerics succeeded in seeing off the oil prospectors in their waters. For now though visitors will have to be more creative to find camera angles that show off the beauty of Santa Cruz without unsightly intruders. For a relatively small beach they were certainly packing it in at Puerto Colon, the large inflatable icebergs were being swarmed over by eager young children and the sea was full of swimmers taking a cooling dip. 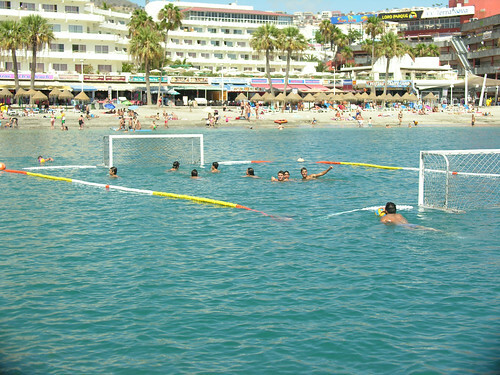 But it was the fourth International Beach Water polo Tournament that had attracted me along the coast on a baking hot afternoon. The floating court was set up on the far side of the bay just below the old El Faro nightclub and the dance music was belting out from the small admin tent set up on the sand. Publicity for this three day event was as ever shockingly poor and few of the sun bathers basking on the beach seemed to have any idea what was taking place although a few of the ladies were showing an interest in the fit swimmers taking to the water in their team coloured budgie smugglers. During the training games I explored the viewing options on the rocks that reach out close to the court, last year at the Water Ski Racing championships the longer stretch of rocks by the harbour wall was the place to be. I was less than graceful picking my way over the uneven boulders but somehow kept my balance. Up on the side coastal path a steady flow of walkers stopped and took a curious look at the court near the mouth of the bay. 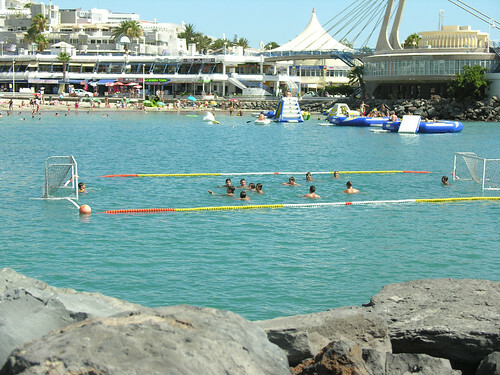 Once it was time for the games to start I thought they would use the PA system to inform and animate the beach users but apart from a few calls to the players it was all banging tunes. 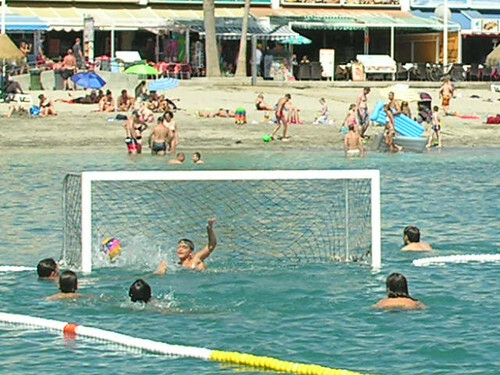 Games are played with four players and a goalie on each team over two ten minute halves, the sides had extra players for substitutions but they had to tread water just outside the court while the referee stood on a nearby rock and controlled the game. It’s a fast flowing sport with plenty of goals and hard to keep track of the scoring with no announcements, but the players team coloured caps and numbers helped to keep track of those taking part. Back on the sand most were oblivious to the action taking place, the African ladies lounged in the shade offering hair braiding and the bars and restaurants were doing a steady trade in cooling down the sun worshippers. 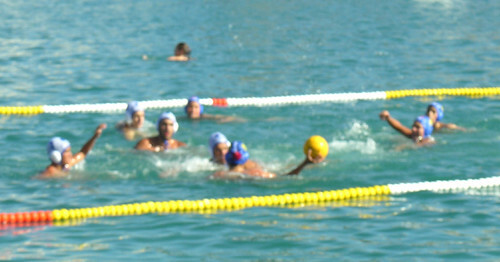 The driving force behind the contest was CN Echeyde, based in Santa Cruz, they play in the Spanish professional league. The contest was an ideal time to push their sport and maybe recruit some more players and fans but there wasn’t much there to encourage any of the curious. The action goes on through Saturday until 8pm and concludes on Sunday from 9 am until the grand final at 2 pm. 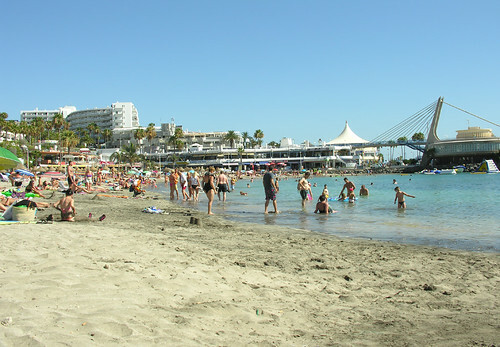 I will be back for more and to see if it captures the imagination of the public and stirs them from their sun beds. Hermano Pedro didn’t blink a stoney eyelid as his Arona town hall forecourt slowly began filling up with fired up rally cars. The church of San Antonio Abad remained majestic and unmoved as marshals cordoned off the Plaza del Cristo de La Salud. 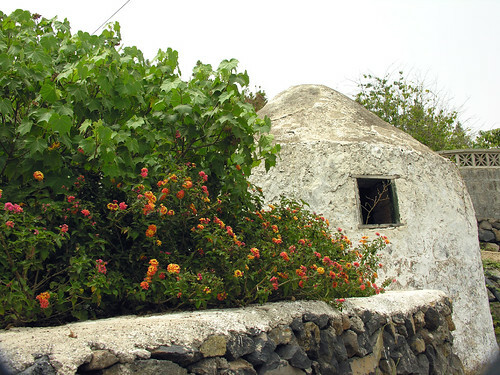 It takes more than the advent of the Subida Arona to La Escalona uphill race to ruffle this proud old town that is the spoke at the centre of the municipality’s administrative wheel. I have used it many times in the past as a gateway to the fantastic walks that reach high up into the surrounding hills but took a little time this visit to wander around and breathe in the history. 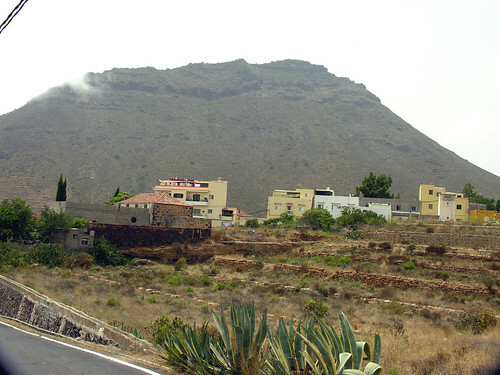 The 25 minute bus trip up from Los Cristianos is always a pleasure as the roads wind their way through La Camella and La Sabinita. The views out over the coast of Arona were a little hazy in the low oppressive cloud but their beauty shone through. I walked down the hill a little to a track overlooking thee barranco where the sound of cool gurgling water piped was the only noise. 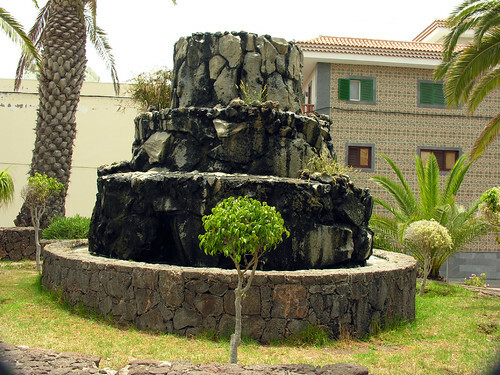 Back up near the bridge over the busy TF 51 I loitered a while in the Plaza Don Antonio Correa Rodriguez, an island of greenery with a volcano like fountain in the centre, surprisingly restful so near to the rushing traffic on the main road to Vilaflor. Arona is a small town but tightly packed with a nice blend of the old and more recent housing, there’s hardly any employment there apart from the Ayuntamiento (council) and a few shops so it tends to empty out in the working day. Following another track out to the well signposted walking trails I could see the challenging side view of Roque del Conde, an old friend of mine along with Ifonche and both well overdue another hike. Another detour took me up to the old wash house of Los Lavaderos, now obsolete as concrete encased pipes feed the mountain water to more modern collecting points. Back in the church square and the feeder streets the cars were assembling for checking, a day ahead of the two day event. 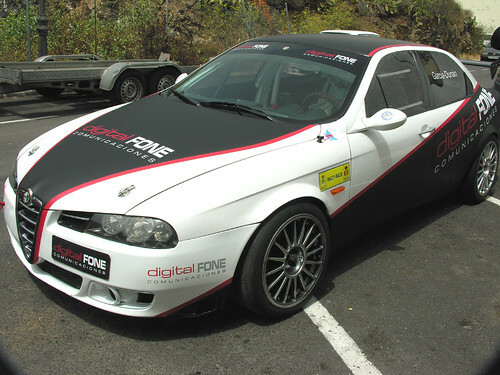 All shapes and sizes were ready to release their inner tiger, this Alfa Romeo 156 2.0 of Garcia and Duran looked sleek and a born winner but sport loves an underdog. Like the annual fiestas, the race is something that catches the imagination of all Arona folk, young and old, many were stealing admiring glances at the machines as the bars revved up for a good weekend of takings. I headed back down to the bus stop with time to cast an eye over the rather stark and modern Plaza La Paz opposite. It looks like a modern leisure area but gives a big tip of its hat to the origins as a replacement for the towns original cemetery. The large archway hints back at the old entrance and the shallow levels are marked out to represent the lay out of the 1840 site. 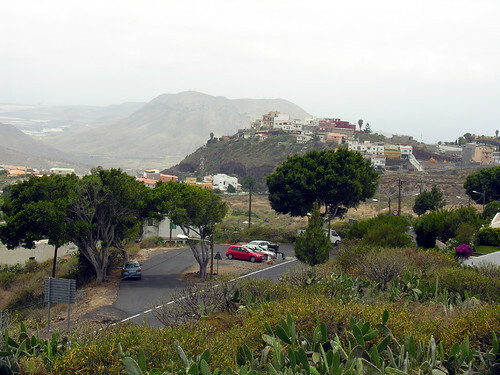 The current layout was opened in 2011 long after the old cemetery relocated just down the hill to Montaña Frias, a small settlement clinging to a prominent hill. I passed that on my return bus as I made plans to return soon for some hill walking exercise.